But then at the 1:20 mark I spied the Thai word for “song” along with the words ยังไม่ลืม, which feature prominently in the chorus — ah-hah! Unfortunately, all the clips that pop up in a youtube search are for a different ยังไม่ลืม. There’s also, at that same spot in the clip, a Thai word I can’t really make out, along with what I’m thinking might be a name, สุชาสินี จัมทน์เอม; could this be the singer? But searches on youtube and google turn up nothing relevant. so I am left only with this incomplete version of the song. In connection with all this is something I forgot to note in my recent post on getting more into reading Thai, which is that when I bought a tablet back in August I immediately installed a Thai keyboard on it, which I’ve been using to hunt and peck my way through small bits of Thai, as a supplement to my older method of cut-and-pasting from various online sources such as google translate, wikipedia, asian fuse, etc. In this case, it came in handy for searching on the (perhaps) singer’s name. 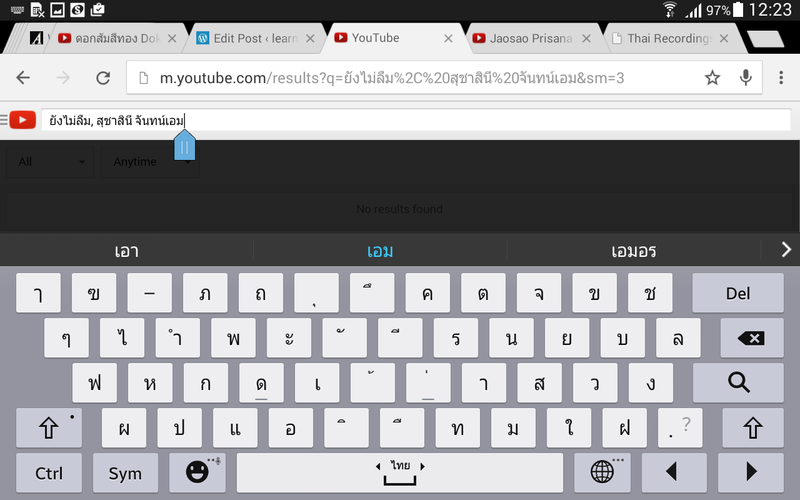 Samsung galaxy tab 4 with Thai keyboard — hitting the shift key gives you the rest of the characters. I’m actually starting to get a little faster finding my way around the Thai keyboard. As for the song…is it really not out there somewhere on the internet? Late 90s ephemera on its way out? Well, half a song is better than none….